Beatriz Garcia reflects on the Cultural Olympiad and the learning that can be passed on to Games hosts of the future. The London 2012 Games mark precisely 100 years since the first official commitment to presenting cultural and artistic activity alongside sport. This centenary year provides a useful moment to reflect on what culture and the arts have brought to the Olympic Games. From avant-garde film making to graphic design innovations, new approaches to public art and new ways of engaging with public spaces, past Olympic cultural programmes have made their mark within the practices of artistic communities in cities as diverse as Berlin, Tokyo, Mexico, Barcelona, Sydney or Torino. However, little is known of these positive experiences and their direct beneficiaries have tended to be a select few. This is because, for most of the twentieth century, the Olympic cultural programme has been viewed as an opportunity to showcase the artistic excellence of the local host – often using a very narrow (mainly Western elite) conception of the arts. As the Games have evolved into a global media event attracting vast global audiences, this premise has become less and less relevant to the average Olympic audience. London’s vision for the 2012 Games included a serious commitment to make its Cultural Olympiad the most accessible, youth oriented, innovative and outreaching Olympic cultural programme in history. For this, London promised a nation-wide programme with an emphasis on showcasing emerging talent from every UK region and nation alongside established world-class acts. Presenting a national Olympic cultural programme is not a new ambition for a host nation. However, most Games have struggled to make it nationally relevant due to a lack of media appeal, conflicting sponsorship and branding regulations, and a difficulty overcoming conflicts of interest between the sports and arts agendas of key stakeholders. To address these challenges, the London Organising Committee for the Games (LOCOG) supported a parallel delivery and promotional structure for culture: from the creation of 13 creative programmer posts based in every UK region and nation, to the establishment of an alternative brand identity for non-commercial Games-related cultural activity – the ‘Inspired by 2012’ mark. These innovations were at the heart of what is distinct about London’s Cultural Olympiad. Following a tradition started at the Barcelona 1992 Games, London 2012 has presented its Cultural Olympiad over four years. Funding from the four UK arts councils through the creative programmers provided flexibility for locally sensitive cultural programming, which previous Games, relying on centralised structures, have found difficult to manage. Furthermore, when the Legacy Trust UK was launched in 2008, it became one of the three principal Cultural Olympiad funders, committing £40m towards four national and 12 regional programmes. This funding imposed a distinct angle to the work presented, as funded activity was expected to have a post-Games sustainability strategy. This is the first time that such an emphasis has been placed on the aftermath of the Games cultural programme, an approach that is consistent with the decision to appoint a Legacy Steering Committee for the Olympiad and fund a Cultural Olympiad Legacy evaluation programme. The commitment to a nationwide delivery structure has resulted in a range of achievements. First, the creation of a network of dedicated cultural operators with a common timeline and underlying objectives has strengthened inter-regional relationships across the country and encouraged new ways of working. Furthermore, it has established a locally trusted contact point for Games-related cultural activity, so that every region has had the same degree of opportunity to programme for the Games, particularly prior to 2012. Secondly, the existence of a creative network, dedicated funding structure and visual mark, have made it easier to market the distinct themes and ambitions emerging out of the London 2012 Games vision into every corner of the UK: from an emphasis on programming for youth as creators as well as audiences; to highlighting excellence within disability arts; new ways of exploring cross-overs between art, sport and health; and innovative approaches to exploring the Olympic Movement ideals. The national network has also enhanced opportunities to showcase non-London based activity on a global stage during the Olympic year and for this activity to become part of the Games long-term iconic imagery. The strong integration of Olympic and Paralympic messages, evident in the ingenious conception of a single design for both the Olympic and Paralympic Games logo, has made the synergy uniquely manifest through the ‘Inspired by 2012’ mark and London 2012 Festival pictogram, which are shared across both Games. In order for the Cultural Olympiad to reach out to the world, it was equally important to maximise media visibility and demonstrate excellence and scale comparable to the sporting competitions. This was the core motivation behind the London 2012 Festival, presented as the culmination of the Cultural Olympiad. 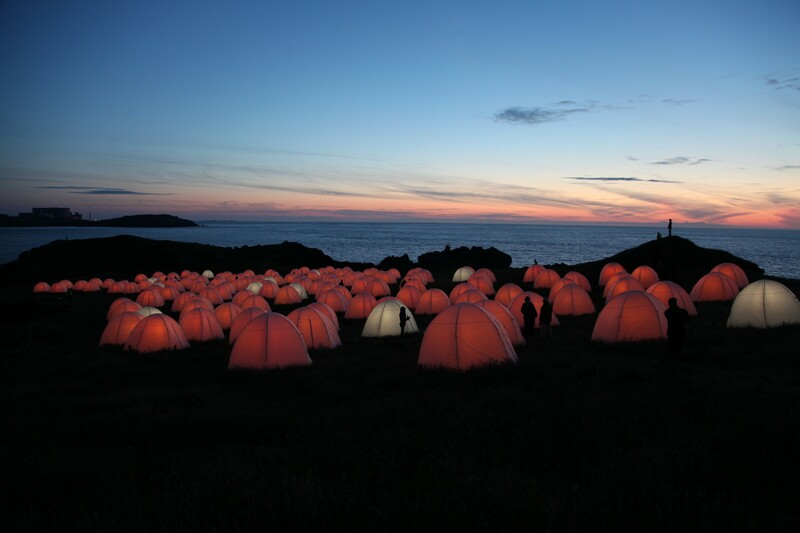 In contrast to the wide scope of activity presented up to the end of 2011, the 2012 Festival was curated by a sole artistic director, Ruth Mackenzie. Thus, the Festival has brought a single vision, focused on the notion of world-class excellence, and emphasised scale, international significance and once-in-a lifetime experiences. The Festival dates overlapped with the final leg of the Torch Relay, the Olympic Games and the Paralympic Games, and the heart of the programme was focused on London and the Games time period. To ensure maximum visibility for Olympic fans, special film commissions were showcased on LiveSite screens across the city (and the country). The London 2012 Cultural Olympiad aimed to advance the Olympic cultural agenda and prove that it is possible to expand the Games experience and co-ordinate activity with diverse stakeholders, from grassroots to world-class organisations. It also committed to making activity sustainable and leaving long lasting legacies. These promises have been largely met, and the approach could become a blueprint for future Games. Dr Beatriz Garcia is Head of Research at the Institute of Cultural Capital, and Senior Research Fellow in Sociology at the University of Liverpool.